A slender tree, sometimes 900 high and the trunk 2 1/2° in diameter; bark reddish or greenish-brown, peeling in very thin layers; twigs reddish. Young shoots, petioles and lower surfaces of the leaves to-mentose; leaves rhombic-ovate, apex acute or obtuse, irregularly serrate or somewhat lobed, base cuneate, when mature dark green and glabrous above, pale and glabrous or somewhat tomentose beneath, 1 1/2-3' long; petioles 3"-8" long; staminate aments mostly clustered in 2's or 3's, 2 1 /2- 3 1/2 long; pistillate aments oblong-cylindric, spreading, peduncled, 1'-2' long, 5"-6" in diameter in fruit; fruiting bracts tomentose, about equally 3-lobed, 3"- 5" long; nut broadly obovate, wider than its wings, pubescent at the base. Along streams and lakes, Massachusetts to Illinois, Minnesota, Kansas, Florida and Texas. Wood hard, strong, brown; weight per cubic foot 36 lbs. The bark of the branches peels off in almost membranous layers. Water- or black-birch. April-May. 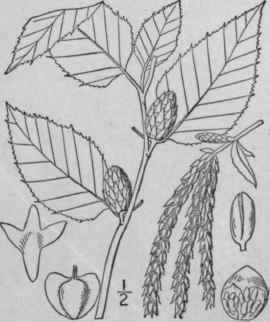 Betula lenta L. Sp. PI. 983. 1753. A large forest tree, sometimes 80° high, with dark brown close smooth bark, becoming furrowed, not separating in layers; foliage aromatic; twigs smooth, warty, young leaves silky. Mature leaves ovate or ovate-oblong, acute or acuminate, the base cordate or rounded, sharply serrulate, bright green, and shining above, dull green and pubescent on the veins beneath, 2 1/2' -4' long, 1-2' wide; petioles 3"-6" long; staminate aments clustered, 2 1/2-4' long; pistillate aments sessile, dense, oblong, about 1' long and 1/2' in diameter in fruit, nearly erect; bracts glabrous or minutely puberulent, not ciliate, appressed, about 2" long, nearly equally 3-lobed, the lateral lobes somewhat divergent; nut oblong, broader than its wings. New England to western Ontario, Florida and Tennessee. Wood hard, strong, dark brown; weight per cubic foot 47 lbs. The aromatic oil of the branches and foliage (same as oil of wintergreen) is distilled in quantities and is an important article of commerce. Tree much resembles the cherry. A hybrid with B. pumila is B. Jackii Schneider. Spice-, river- or mahogany-birch. 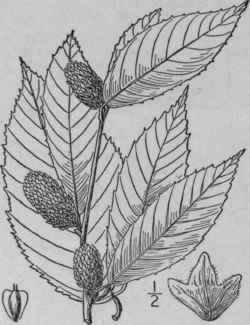 Mountain-mahogany. April-May. B. alleghanensis Britton, Bull. Torr. Club 31: 166. 1904. Similar to Betula lenta and to Betula lutea, the bark either close and fissured, or peeling off in thin layers on young trunks and branches. Leaves ovate or ovate-oblong, usually acuminate at the apex, cordate or rounded at the base, 5' long or less, sharply and rather coarsely toothed, hairy when young, glabrous when old, except on the veins beneath; staminate aments clustered; ripe pistillate aments oblong-cylindric, short-stalked or sessile, about 1' long, their bracts nearly or quite as wide as long, more or less pubescent, 3-lobed to about the middle, the margins ciliate; nut narrowly oblong to obovate, broader than its wings. Woodlands, Massachusetts to Quebec, Michigan and Georgia. May.